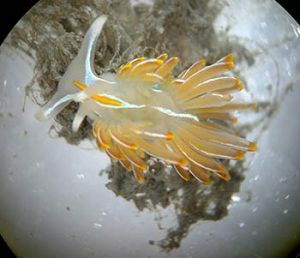 An opalescent nudibranch is a native species common in Prince William Sound. This one was found during the September bioblitz. A crew of marine biologists ventured to Prince William Sound this September for the third Smithsonian-led “bioblitz” in Alaska, this time in Valdez. During a bioblitz, volunteer citizen scientists team up with professional scientists to search for invasive marine invertebrates. This year, the Smithsonian partnered with the council and Prince William Sound College for a week of scientific sampling. Three months before the bioblitz, council staff placed “settlement plates,” sheets of sanded PVC that the invertebrates attach to over time. During the bioblitz, volunteers and staff collected the plates, towed plankton nets, set crab traps, and went scuba diving, to look for various nonnative species. The study helped establish critical baseline data for future research, invasive species management, and conservation initiatives. Fortunately, no new non-native species were found during the bioblitz or the scientific sampling. Students put together the drones prior to a test drive. Four Homer high school students, a project leader, and lots of volunteers took part in the center’s “Creating Teen Leaders through Marine Technology and Research” program this summer, helping monitor for aquatic invasive species throughout Kachemak Bay. 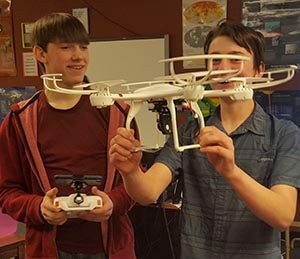 The students built an underwater remotely operated vehicle, or ROV, from a kit, which they used to explore the Homer and Seldovia harbors for aquatic invasive species. “We all had various skills that we could contribute but it took all of our expertise to organize, create, and improvise the structure,” said Landon Bunting, one of the students, describing the teamwork that developed between the students during the project. The council is collaborating with the Prince William Sound College and the Smithsonian for a two-day Marine Invasive Species Bioblitz on September 9 and 10 in Valdez. 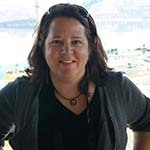 Learn about invasive species that threaten Prince William Sound and look for them in Valdez Harbor. Your help with this bioblitz will help establish critical baseline data for future research, invasive species management, and conservation initiatives. Pre-training workshop on Friday, September 9. Expedition to look for invasive species in Valdez harbor.